Why do I shoot Film? Frame colour combinations are intended as a guide only & are not to scale. The 'signature box' & the print 'bleed edge' are not shown. Upon order placement, I will contact you to confirm your framing selection. - Click to see more 'Framing & Timber Details' . - Click to see 'Finished Framed Prints' for sample finished framed prints. All images in the gallery can be ordered as prints only (shipped in tubes), framed prints, canvas prints & soon to be available acrylic photo blocks. Choose from our large range of frame styles. Our framed prints are stylish & classic, they are a very popular choice. Framing options above are simulated & are for illustration purposes only. We will contact you upon placing your order to discuss your framing options in more detail. Timber moulding, finished frame dimensions & more frame detail can be found here. Classic "Black" & "White" Timbers are also available. All large prints are posted directly from our lab to you to and are inserted into shipping tube (and wrapped in protective foam) after being carefully rolled. You can keep your print inside this tube to protect it until you decide to frame or mount the image. Take the print to your framer of choice. Care needs to be taken when unrolling the print, be careful not to scratch the printed surface. It is recommended that you only check your print once upon receiving your order, and then return the print to the tube. All canvas prints are printed by Fotofast in Brisbane. As all canvas prints are handmade items, the end result can differ greatly, it takes years of experience to print and manufacture high quality canvas art. The Fotofast team is lead by their very own fine arts graduate who understands our needs. Canvas Wrap Choices: The default canvas wrapping features a back edge, however a white edge and mirror wrapping is also available. We will contact you to discuss options upon placing your order. Dicky Beach is a suburb of the Sunshine Coast, Queensland, Australia, located within the Caloundra urban center. The area was named after the iron steamboat, the SS Dicky, which ran aground during heavy seas in 1893 It was re-floated, but again, heavy seas turned the ship about and back onto the sand where it remains to this day. 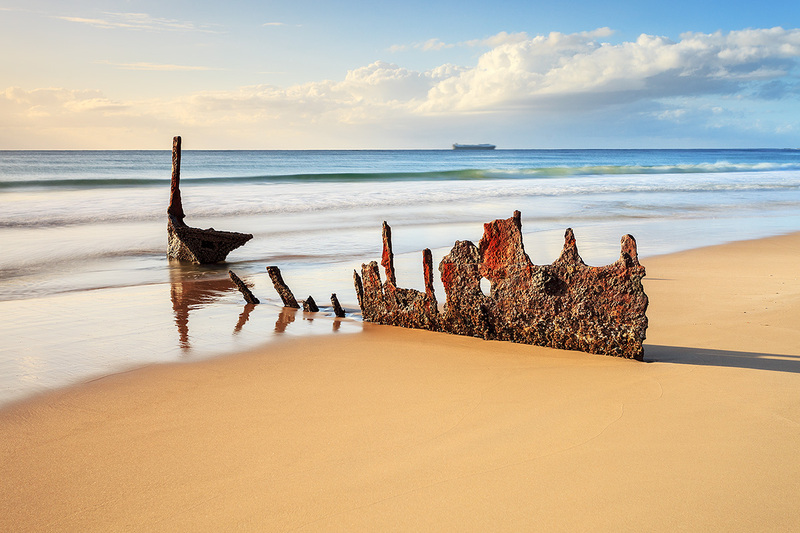 Dicky Beach remains the only recreational beach in the world to be named after a shipwreck. The shipwreck is due to be removed from Dicky Beach on Thursday 30th 2015. 122 years,1470 months & 44,734 days after first running aground. Capture Date: 28th July 2015.